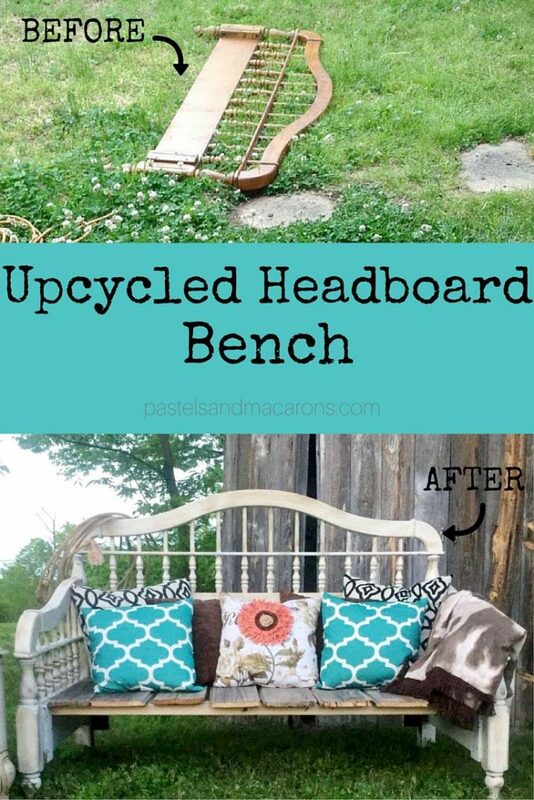 You are here: Home / Home Ideas / DIY and Craft / DIY Headboard Upcycled Bench- A Rustic Inspired Project! 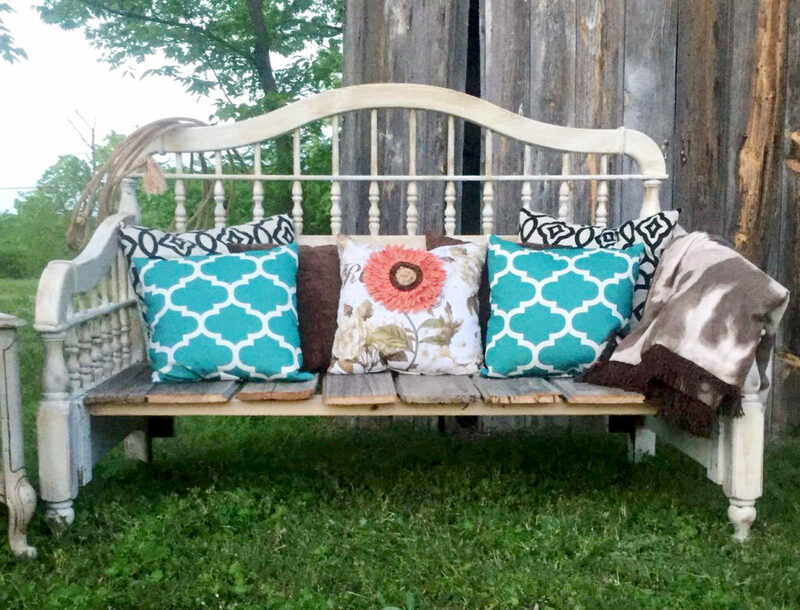 Today I’m featuring this beautiful DIY Headboard Upcycled Bench that will leave you wanting to make your own! 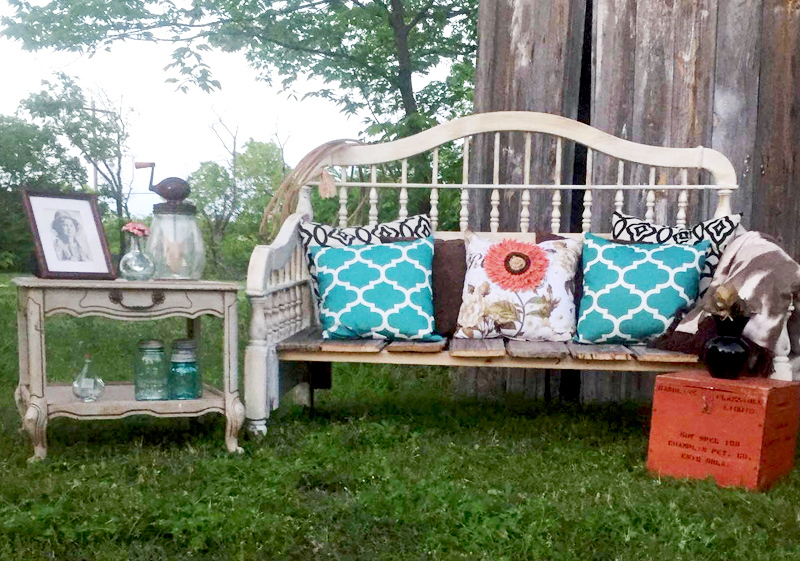 Stephanie shares her fabulous DIY Headboard Upcycled Bench with us and the steps she took to create this great piece! Boy do I have a treat for you guys today! Now that the weather is warming up it’s all about outdoor settings and seating and beautiful patio areas. I recently came across this gorgeous upcycle in a DIY group I belong to. I love seeing projects from “real” people. I’m a blogger and I try to make my photos look as visually appealing to you as possible and some bloggers who are far outside my level of talent and on a level I could never reach do some amazing projects that we all think “Wow!” But the problem is that sometimes those projects can seem scary and intimidating to try and conquer because of all those gorgeous photos that the every day person might be scared to give it a go or the project itself is far too hard to try and make. 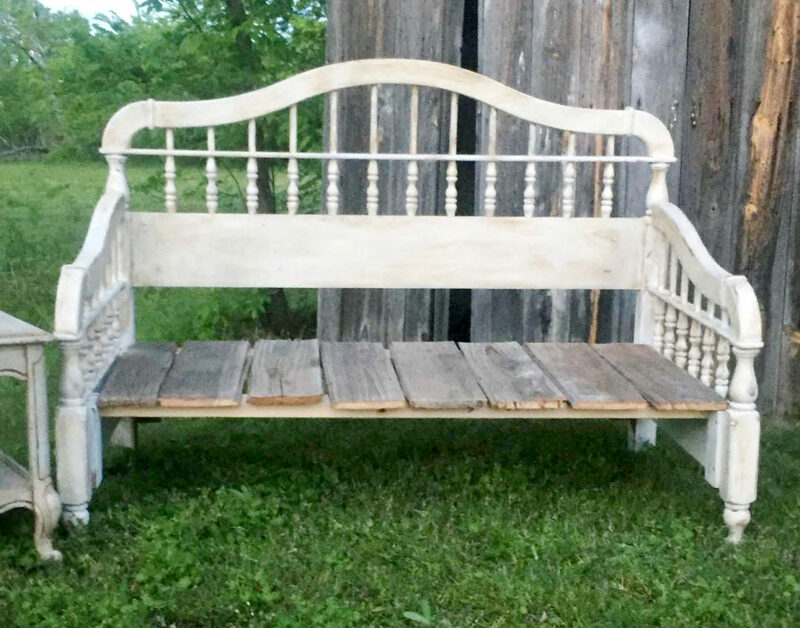 So when I saw this awesome DIY Headboard Upcycled Bench I fell almost off my chair because not only was it gorgeous and such a great idea but it’s something anyone with any level of DIY experience can make. What a fabulous idea, a great use of what would otherwise be junk and how it got turned around to become a beautiful statement piece in someones patio! Win for everyone, especially the headboard! *This post may contain affiliate links for your convenience and at no extra cost to you. To learn more please read my disclosure policy. 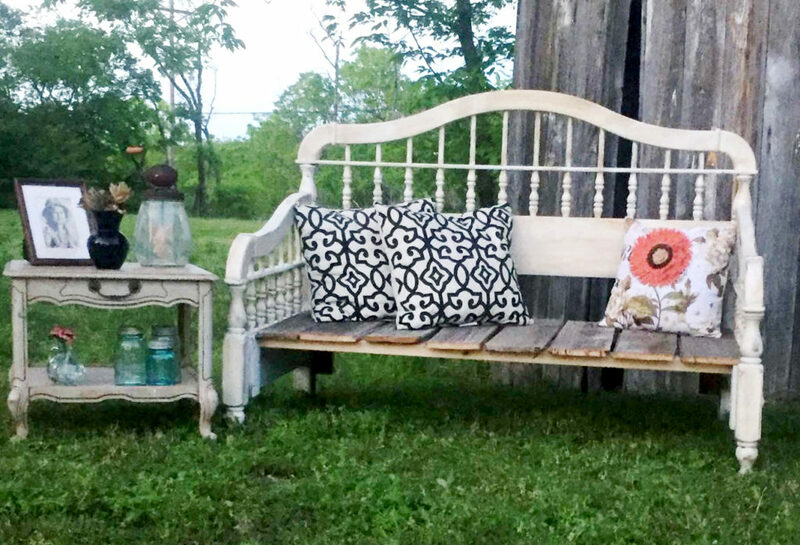 Love this bench but you don’t have the time to make it or you just aren’t into DIY? Here are some benches I found to give you a similar look! I made my DIY Headboard Upcycled Bench from the queen size bed I was using before my now amazing new king size bed arrived! I have a five month old baby who absolutely insists he needs 90% of the bed, so I thought I would make my 10% a bit bigger. This bed frame holds sentimental value for me. My 87 year old great grandmother and I live together, and this bed was an anniversary present to her from my late great grandfather. It was one of the last gifts he gave her before he passed. Over 20 years ago, he had a stroke and passed away in ‘95, so I really wanted to keep this piece. I wanted it be something that was used, instead of an old bed sitting in storage. My awesome step mom gave me the idea to make a bench when with it when we moving the bed out of my room. I took the idea and ran with it. My sweet boyfriend, Matt, and I had no idea what we were doing. We completely winged it! I knew I wanted it to look rustic, but make it my own. 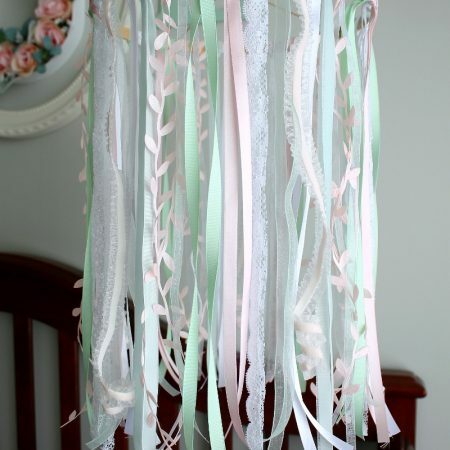 It goes perfectly with the theme of my house which I call, ‘Rustic but I am still a girl’. Lol! 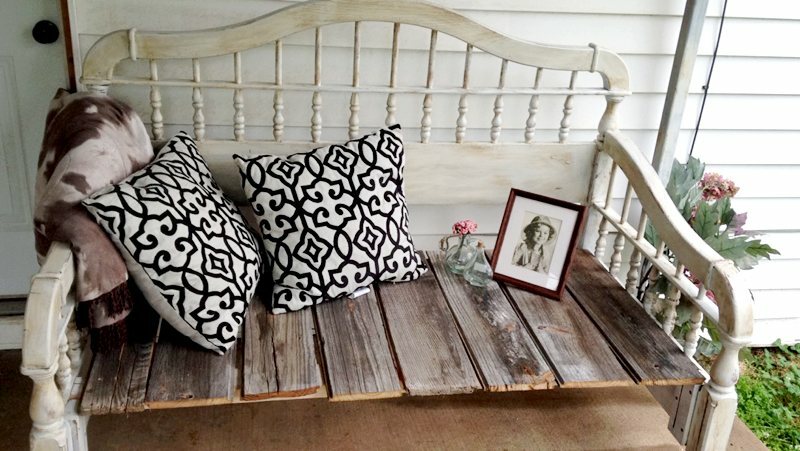 Here’s how we did it and how you can make your own DIY Headboard Upcycled Bench! 1. 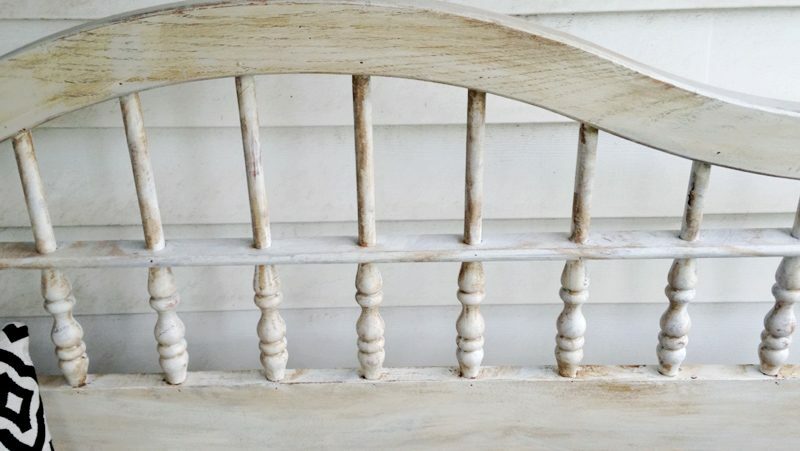 The first thing we did to create this DIY Headboard Bench was sand the baby down! Although, not thoroughly because my hand was tired after the first section of the headboard. So some parts were really sanded, other parts were a little sanded. We definitely made sure we sanded off the glossy finish though, which is what was important for the paint to stick! 2. I wiped it off with a damp wash cloth and then went over it again with a dry cloth. 4. Next, we used 2 x 4 x 8’s to build the support for the seat. We ended up cutting the 2×4’s down to 5’ in length. In correlation with the picture, the boards run east to west in between the arms, on the North & South side for a total of 2 main support beams with shorter support beams running North and South in between. 5. Next was the fun part! 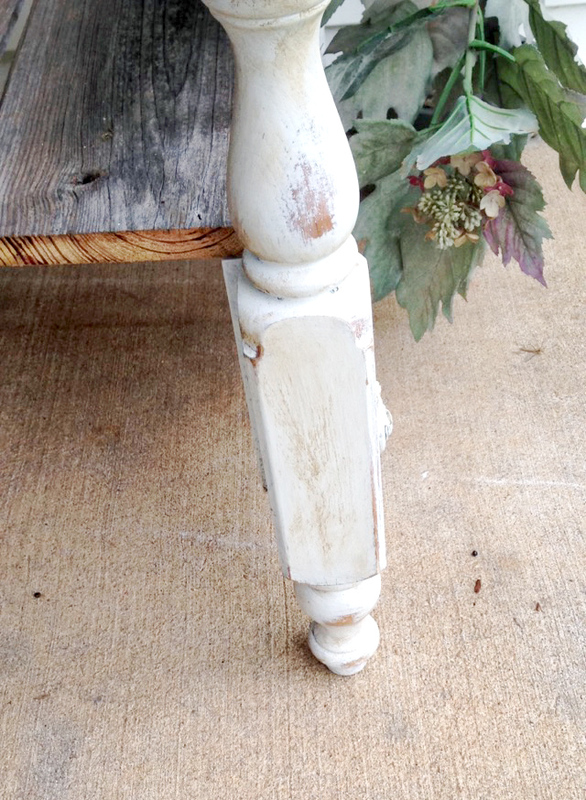 The paint I used was Valspar’s 3 step chalk paint process. 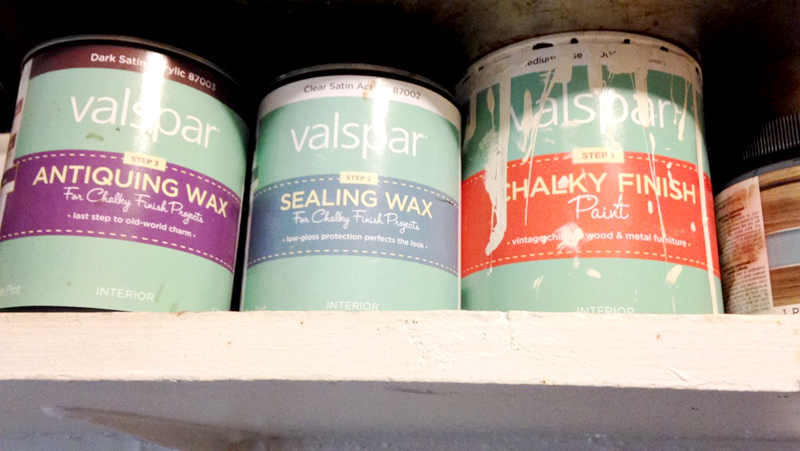 I bought antiquing glaze and a Dark Walnut stain, but decided against using these once I was done with the Valspar. Forewarning, I am a person who strongly believes in ‘winging it’. I am also extremely impatient, so I was put on Santa’s naughty list and did not follow directions to a T. Which, worked out for me. I applied the Valspar ‘Her Dainties’ colored chalk paint on every inch of this piece (except the support beams, originally I planned on staining them but decided against it). I applied one coat on some parts, and two coats on the main areas like the bottom portion of the headboard and the curved part of headboard. This paint dries pretty quickly, so add that to my impatient nature and I most definitely did not wait the full 60 minutes for drying time. I figured by the time I was done the whole bench, where I started was dry! I painted with the grain of the wood, I also was very stingy with the paint. I made sure to make this paint work for it, and spread it out as much as I could. As the sections dried (okay or maybe they didn’t but hey, judge me) I would sand my little heart out in some places and be start-then-quitter in others. Not waiting for the paint to fully dry and sanding actually gave it more of a distressed look. 6. After my impatient painting and sanding process, I applied the sealing wax with a brush, although after this project I definitely will be using a rag to apply with in the future because it makes it easier to get in the little crevices. Valspar was good to me and said I only needed to let this dry 1-2 minutes. So I took a stretch break and rehydrated. I wiped the excess wax off with a dry cloth. Then I sanded with a ‘finishing sand paper’ I found at Lowes. This is a very low grip sand paper. I only sanded in the places I feel would have been worn over time if this had always been a bench. Like edges and the arms. 7. Then, despite much protest of my boyfriend because he already thought the piece was ‘badass’ (I know, he needs a dictionary), I applied the antiquing wax. Note: Careful on how much you use, this stuff can get away from you quick! I made sure to work with the less is more option and was careful to only use small amounts as a overly antique look isn’t what I wanted. Some crevices got a lot, some got none. I applied more on the parts that I wanted to be darker (I didn’t really have a technique, I was just having fun!). I then used a dry cloth to wipe off the excess. Do this quick because it dries very fast. This is not the time to give your boyfriend a wedgie and then suffer the reprimands of it. I may or may not speak from personal experience. Although I think my bench turned out great, I am my biggest critic so there are some parts that I wish I would have followed my own advice. 8. For the seat, I was in luck. I have a barn, and like honey to bee, I had an old door to the barn sitting in there that had long been forgotten. The wheels were rusted. The wood was splintered, rough, and rotted out in some parts. Non usable barn door = project dream! We cut the pieces to about 3 foot in length (maybe less) and kept the width. 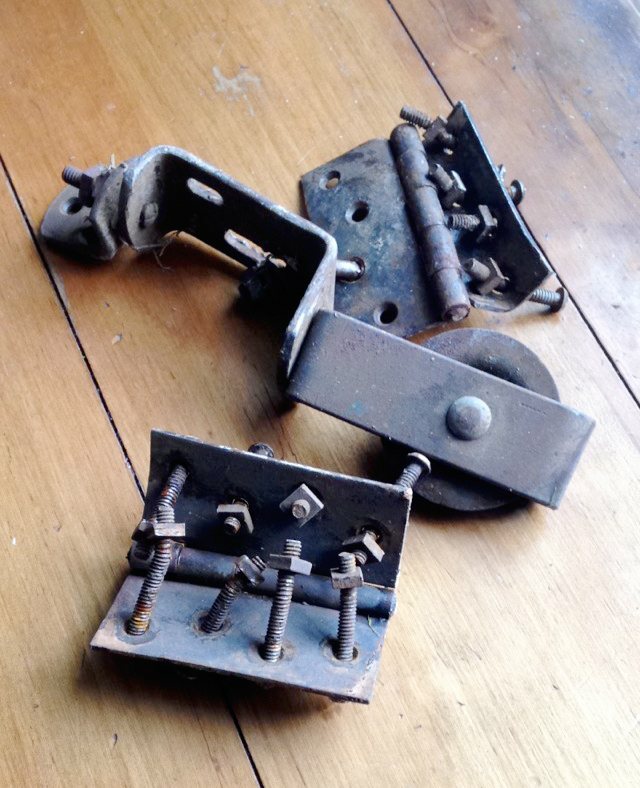 Matt (see I am giving him credit now) knocked off the old hinges and wheels and cut the pieces. We spaced them out over the support beams, we didn’t have a reason. We just liked it and felt like it gave it character! Then we drilled down some screws, sanded out the rough parts, added some poly for protections, sat our rather large butts on there for a support test, and voila we had a bench! I threw a cowhide blanket, some pillows I had been wanting off of my couch, a Shirley Temple photo that is/was my grandmother’s (she gave it to me, but she is still alive so I panic and not really sure what tense to use here) and some little knick knack glasses for decoration! I put the wheel and hinges in a vase because I loved them! We have other projects in the works for the remaining part of the door, I will let you know when they are they finished. 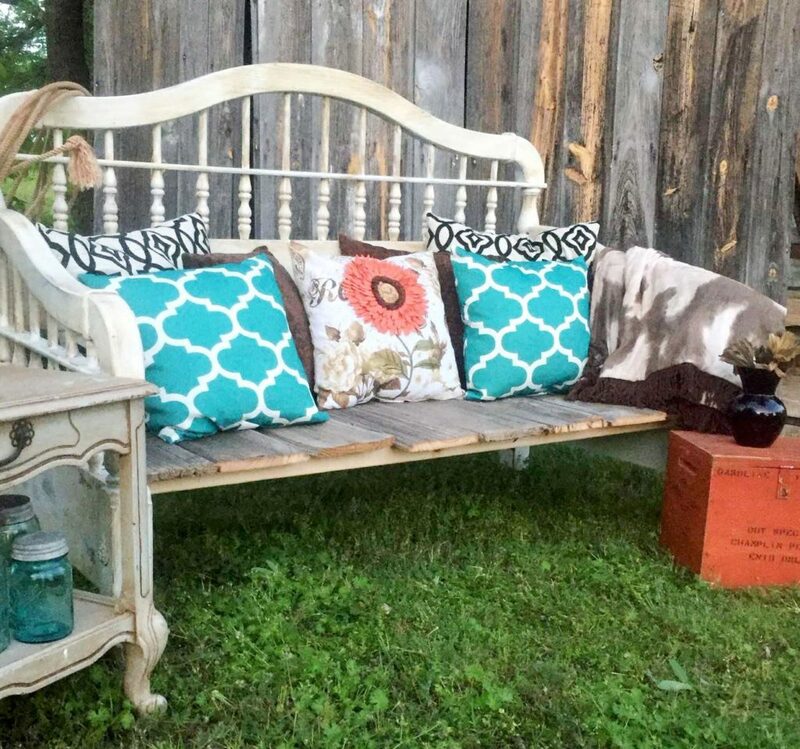 Thank you to Stephanie for allowing Pastels & Macarons to share her gorgeous DIY Headboard Upcycle Bench with us! There you have it guys! How cool is that!?! I am IN LOVE with this gorgeous bench and I feel honoured that Stephanie allowed me to share this gorgeous creation with you today! Please share this around so others can see her wonderful work! The after is simply exquisite! I love the way she has styled it and made sure to keep the deco vintage/rustic with some beautiful modern and elegant patterns! Hope you enjoyed looking at this gorgeous creation as much as I did! If you have any questions, pop them in the comments and we will answer any questions you may have on this project! This is amazing! 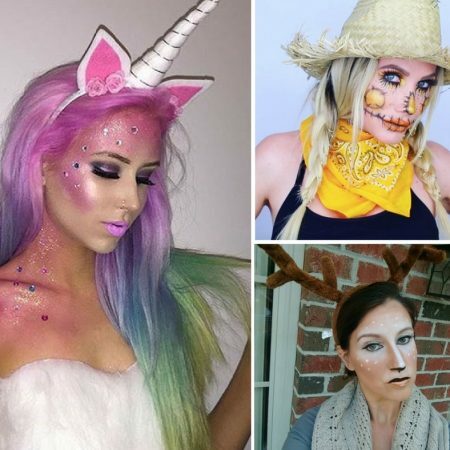 You have some serious skills, girl!!! Ok, hello! I think I had almost the same headboard which I got rid of. What a great idea. I love it! Bummer. I should have kept it. This is absolutely beautiful. 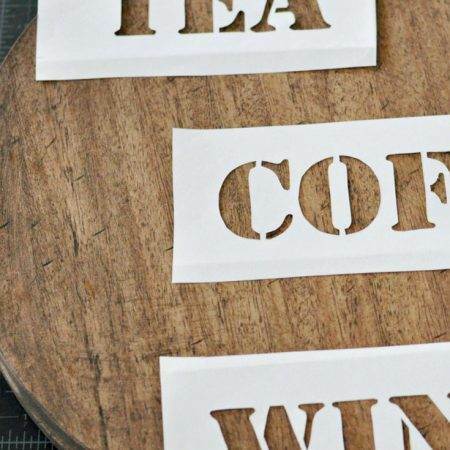 What a great way to keep an heirloom! How awesome is this!!!! Very beautiful and great upcycle! Vey cool project!! 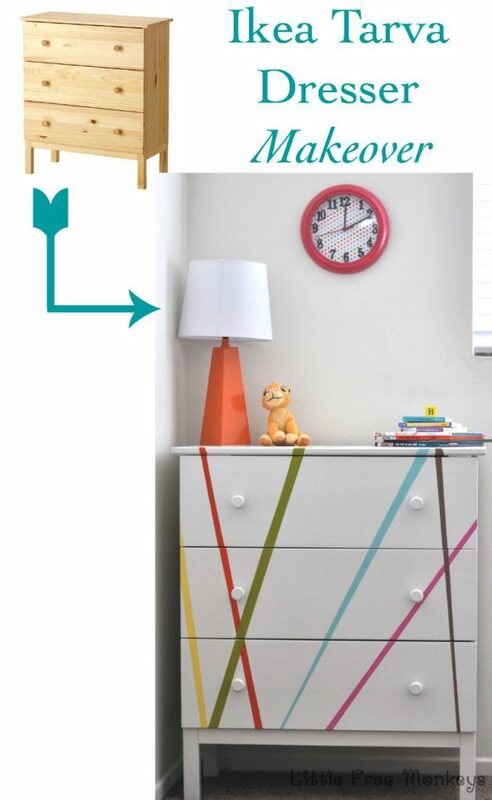 Great idea to transform a headboard like that!! 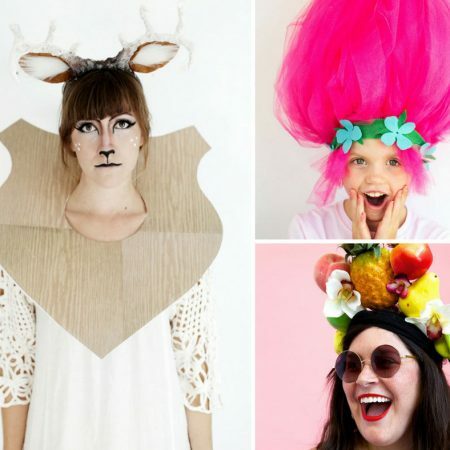 THIS IS JUST BEAUTIFUL AND SO CREATIVE. LOVE THE COOL OFF-WHITE LOOK. SO FRESH LOOKING. HOWEVER, YOU LOST ME ON THE SEAT PLANKS. O.K TO LOOK AT, BUT ….OUCH! 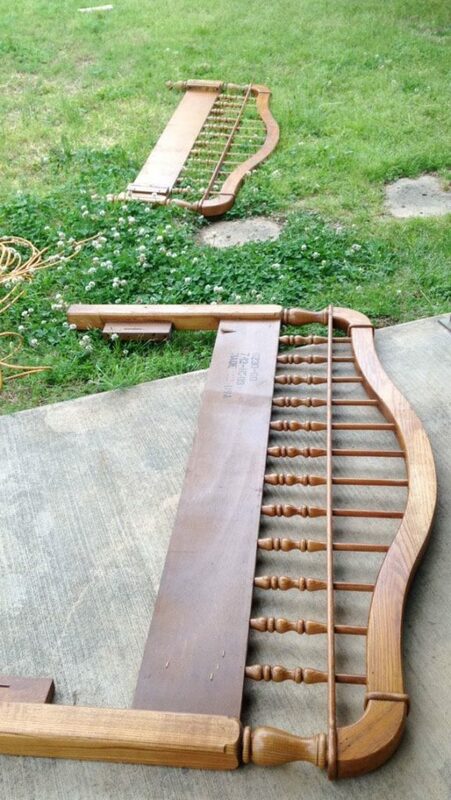 NOT AT ALL COMFORTABLE….THEY CONFLICT WITH THE FINISHED LOOK OF THE BENCH, IN MY OPINION. 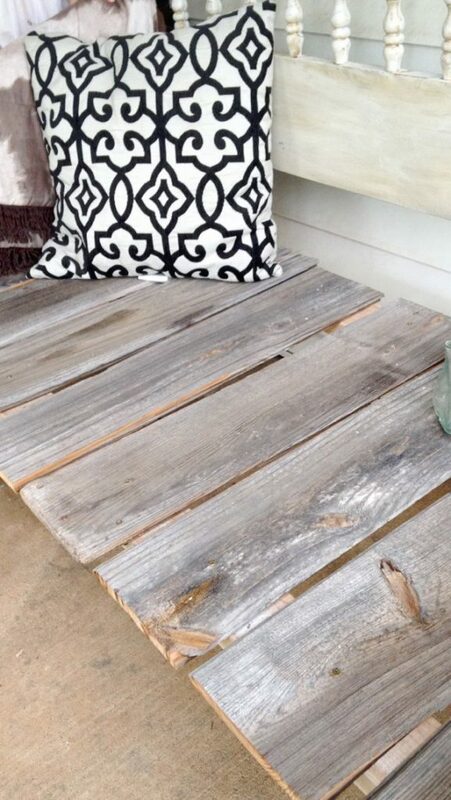 I WOULD HAVE USED LONG PLANKING FROM SIDE TO SIDE, OR AT LEAST, IF USING THE SHORT PLANKS, HAVE FINISHED THEM THE SAME AS THE REST OF THE BENCH, OR A COMPLIMENTARY COLOR PICKING UP THE PILLOW COLORS, …..TO COMPLETE THE LOOK. JUST MY HUMBLE OPINION. I UNDERSTAND YOU LIKE THE “RUSTIC” LOOK, BUT JUST A BIT TOO RUSTIC FOR ME. IT IS A FABULOUS PROJECT AND YOU DID A SPECTACULAR JOB WITH THIS RE-DO. CONGRATS. EXTREMELY….. WELL DONE! I want one only on mine I want a great big fluffy seAT CUSHION.